EL PASO — On Monday afternoon, a 4-year-old Guatemalan boy in a New York shelter sat thinking his mother abandoned him after the two were separated by immigration agents at the border. Meanwhile, the boy’s mother, Miriam, sat at a shelter in this border city, unsure of how she would reunite with her son and explain to him she didn’t turn her back on him — that she’s called and tried to find out if he’s OK, if he’s sick, how he’s being treated. Mario, who fled Honduras with his daughter, was struggling to talk reporters that same day — his daughter's 10th birthday. That’s because being able to talk to her and wish her a happy birthday would be easier — if only he knew where she was. Those were just two of the stories that emerged Monday after the Annunciation House, a downtown shelter that’s taken in migrants and refugees for decades, invited reporters to hear from families amid President Donald Trump’s "zero tolerance" policy on illegal immigration. Their stories reflect what critics of the policy say is the chaotic aftermath of a shoot-from-the-hip style of governing that was supposed to deter migrants from coming to this country to seek asylum but has instead led to confusion and anger over what, if anything, will be done to reunite parents with their children. In all, 32 people were released to the Annunciation House Sunday. 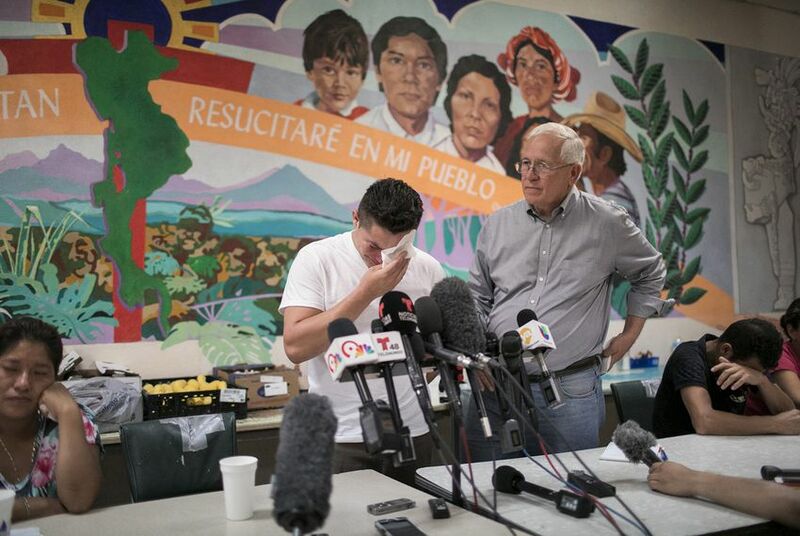 It was the first group of parents to be released by U.S. Customs and Border Protection after having their charges for illegal entry dismissed since the recent "zero tolerance" policy began, shelter director Ruben Garcia said. Twenty of the parents are from Honduras, 10 are from Guatemala and two are from El Salvador, and 29 of them have not spoken to their children since they were separated, according to a fact sheet produced by Taylor Levy, the shelter’s legal coordinator. In all, more than 2,500 children have been separated from their parents or guardians after crossing the border to seek asylum. The migrants in El Paso spoke to reporters the same day that a spokesperson for the federal Health and Human Services agency told reporters outside of the tent camp for unaccompanied immigrant minors that his agency was doing its best to reunite the families. He said that anecdotal stories about parents unable to talk to or even locate their children are not indicative of the overall success the agency has had in reuniting reconnecting the parents with their children. “Overall, these kids are connecting with their parents and we know where their parents are and we are working as fast as we possibly can to reunify children with sponsors here in the U.S. so they can go through the immigration proceedings,” spokesman Mark Weber said. Garcia became visibly upset when a reporter told him what the spokesman had said. “You have 32 parents here who will say to you that is categorically untrue,” he said. It requires family members to leave a message with their information and their child’s information, then wait for the federal resettlement agency to pass the message to the shelters. Mario said he called the number several times while detained and since his release but that it hasn’t been useful. Levy, even as a legal representative, said she’s faced hurdles. Even as he waits for information about where his daughter is, Mario has already thought about what he will say to her once he’s able to see her again. “It’s going to be hard, but the first thing I can ask her is to forgive me,” he said.